Is the effectiveness of water picks underestimated? Not every patient adopts the "gold standard" of oral hygiene, i.e. toothbrush combined with dental floss and interdental brushes. It is therefore sensible to have a recommended alternative to hand. In these cases the water pick can be considered a complement to tooth cleaning. The following study overview shows that the water pick is much better - i.e. more effective - than its reputation suggests. The author carefully examined a large number of studies and assessed their results. This indicated, among other things, that water picks used in addition to toothbrushes had a positive effect against gingivitis and that they are the method of choice for orthodontic patients. Bartsch, T. / Brocker, W.
Because of their monolithic property, allceramic crowns and veneers are regarded as problematic for anterior tooth restoration. This case describes an aesthetically successful anterior restoration using the CAD/CAM method with CELTRA. The material with the "new DNA of high-strength glass-ceramic" is characterized by reliable handling in practice. Even tips and thin walls, as on the cervical edges of the canine veneer in the present case, are released reliably from the milling machine and can also be processed safely subsequently, e.g. for contouring and polishing. 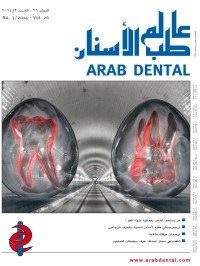 The author presents a case where using modern temporary crown and bridge materials facilitates the fabrication of temporary restorations that achieve natural aesthetics and meet the highest standards of reliability. Model and photo analysis, diagnostic wax-up, mock-up and temporary restorations are important tools for enlightening patients and anticipating the results which can be achieved. Using the method presented here by way of example, this can be accomplished without the need for irreversible treatment steps and only requires comparatively little time and effort. The prerequisites are a careful diagnosis and the use of high-quality products for the temporary restoration. Chasioti, Evdokia / Chiang, Tat Fai / Drew, Howard J.
Prosthetic guided implant surgery requires adequate ridge dimensions for proper implant placement. The goal is to develop time efficient techniques, which have low morbidity. The article discusses space maintaining tenting screws, used in conjunction with bone allografts and resorbable barrier membranes, to ensure uneventful guided bone regeneration (GBR) enabling optimal implant positioning. The authors present VITA SUPRINITY, the zirconium oxide-reinforced lithium silicate ceramic, with which they work regularly and which has been on the market since 2013. Using a case description, they report on their experiences after just one year with the new material and give tips on working it. Thirty patients with similar dental caries on both sides of the jaws were selected. After cavity preparation, each tooth was randomized to one of the following restoration methods. Teeth in the control group were restored using etch-and-rinse adhesive and universal microhybrid composite resin. Restoration in the control group was similar except that 2% chlorhexidine solution was applied on the etched dentin for 60 seconds. Chlorhexidine significantly decreased immediate postoperative sensitivity of posterior teeth by composite resin. Meeting patients' aesthetic demands is a great challenge in implant treatments. However, choice of the right material is even more important. Experience has shown that the ceramic is often overstressed because of the absence of tactile sensation with fixed or partly removable porcelain veneered implant-borne restorations, which can lead to chipping or even fractures of the framework. The author describes a successful full restoration with operator-removable porcelain veneered bridges on a total of twelve implants.